The shoulder pillow is thick and a little heavy so it stays on the eye area nicely. However there is nothing to attach this to the shoulder while sitting down. How to Use: Microwave this pollow with the words facing down (this is the side that's not touching your eyes) for about 1 minute 50 secnds on 600 Watt or 2 minutes on 500 Watt. If you see Japanese words appear on the lighter and softer side of the mask (the one you put onto your shoulder) then the mask is too hot and shouldn't be used until the words disappear. 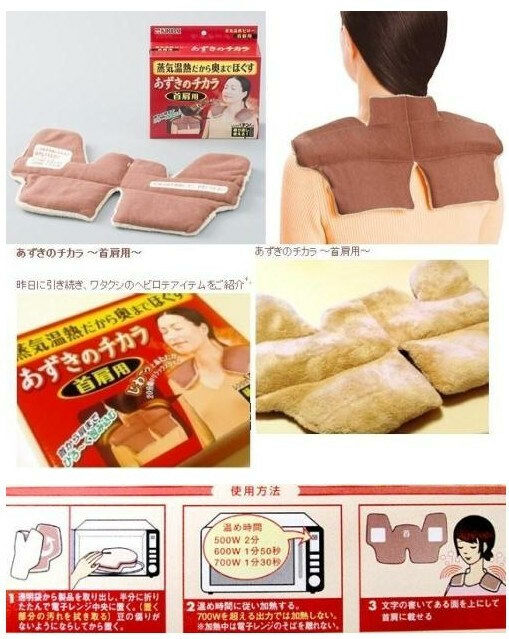 A must-buy product, so relaxing and ease my pain on the shoulder. Recommend for people who use computer a lot. Had bought three pairs in total, love it so much!!!!! And i not only use it for the shoulders, but also on my stomach when i am on period. It is warm and smells really good.